Bruce Perry | What can I learn today? Who was sport’s first streaker? I love going to cricket games, especially at the Gabba in Brisbane, which is home to some of the world’s most impressive beer cup snakes. Sadly, it’s also home to some of the world’s most humourless security guards, who take great delight in puncturing any errant beach ball that makes its way on to the ground. Honestly, would it kill them just to throw them back into the crowd? With such mean spirit I’d hate to see what they would do to a streaker! And believe it or not it’s a question I’ve actually been pondering today. It all started over lunch with a fellow cricket tragic, where we re-lived some of our favourite Gabba games, mine being a New Zealand v South Africa one-day international where Chris Cairns went the tonk to claim victory in the last over. We’ve both seen the greats in action, and some great action, but neither of us could lay claim to spotting a streaker. 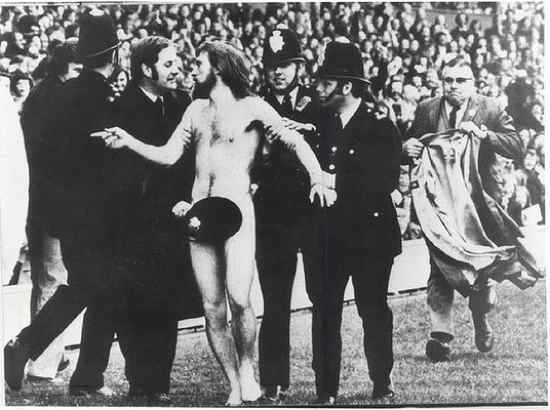 Which led me to wonder who the first big-name sporting streaker was. And in a piece of history that actually makes me pretty proud of the green and gold, that honour goes to a fellow Aussie. His name was Michael O’Brien who, on April 20, 1974, decided to make his mark on sporting history by running on to the ground starkers during a union match between England and France at Twickenham. Decades later Perry had the chance to fly to Australia for a reunion with O’Brien courtesy of the Ch 7 program Where Are They Now, which finally convinced O’Brien to tell his story. Streakerama holds a transcript of the interview by Mel Doyle and David Koch. Here’s an excerpt..
Like the classic song always said: C’mon Aussie..